Really good room for my recent stay. On the go breakfast much appreciated. Loved the place.will recommend to anyone. Good location.near to city centre. I was really pleased with the friendliness of the staff, how big the room was, the location and the possibility of take away breakfast. Really pleased. 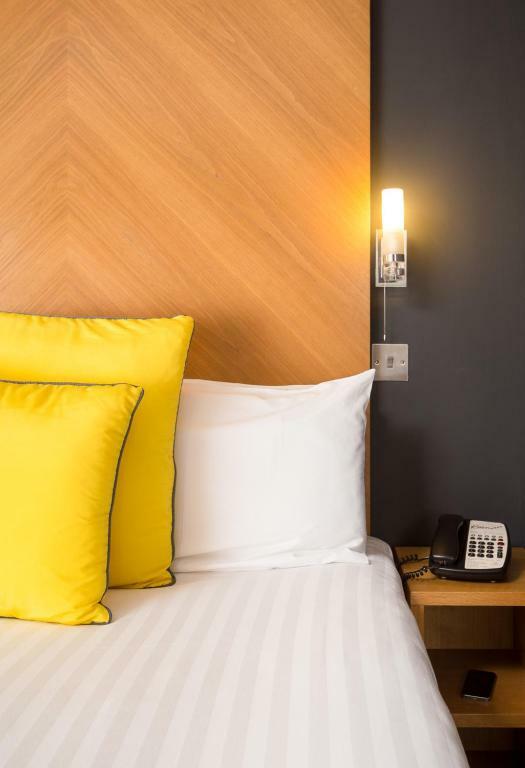 I would not hesitate selecting Roomzzz hotels again on my next trips! I was impressed that there was a grab and go breakfast on offer in the morning and hot drinks throughout the entire day! I also found the staff very helpful. Roomzzz gives me a serious second home vibe. Breakfast is decent, rooms have got everything you need to feel secure and comfortable and staff makes you feel taken care off (Marcel is a great, chill and funny lad, he helped us a lot). Would defo recommend! Wow, it was SUPER nice, clear, comfortable and convenient, with professional and welcoming staff. Great location, awesome place, all the amenities, HUGE space. Did I mention clean and comfortable, and awesome location? So happy. 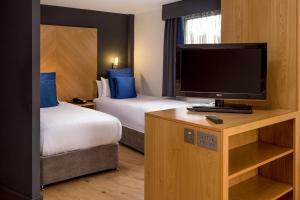 Looking forward to staying here again when I come to Leeds. Lock in a great price for Roomzzz Leeds City West – rated 8.7 by recent guests! Roomzzz Leeds City West This rating is a reflection of how the property compares to the industry standard when it comes to price, facilities and services available. It's based on a self-evaluation by the property. Use this rating to help choose your stay! 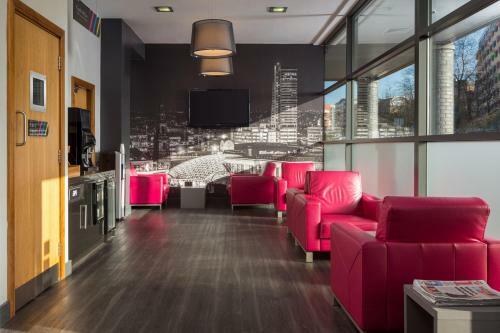 One of our top picks in Leeds.This stylish aparthotel is less than 1 miless from Leeds Rail Station and Leeds city center. 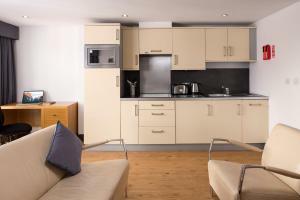 Free Wi-Fi, a flat-screen TV and an open-plan kitchen is included in each spacious and modern apartment. Guests can purchase basic food items from Roomzzz Leeds City West Pantry shop. A grab and go breakfast is available to all Roomzzz guests each morning and consists of freshly baked pastries, hot drinks, fresh fruits and fruit juices. A fridge-freezer, microwave and washing machine are available in each apartment’s kitchen. Living areas feature a flat-screen TV and work desk that also functions as a breakfast bar. Bedrooms have light wood furnishings and a private bathroom. Free telephone calls to UK landlines are included. Bars and restaurants are within 1 mile of Roomzzz. The M621 is less than 10 minutes’ drive away and the Royal Armories Museum is under 2 miles from the aparthotel. 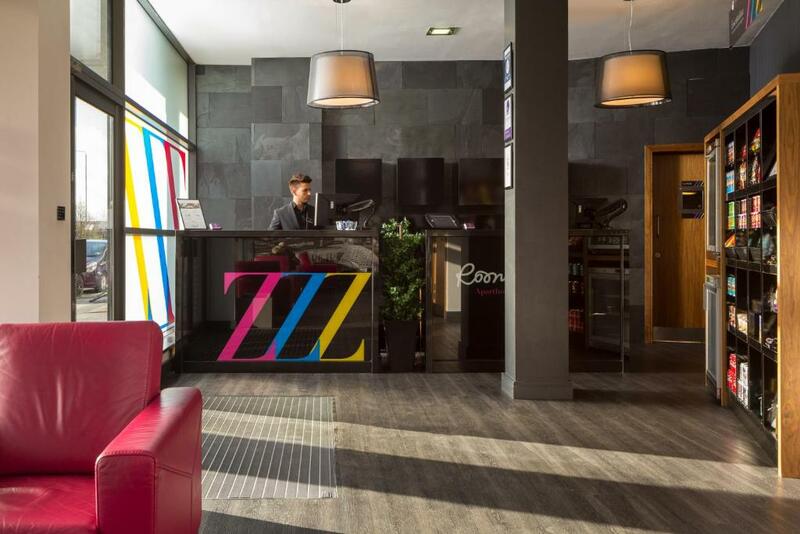 When would you like to stay at Roomzzz Leeds City West? Spacious apartment, some with city views. Smart studios have a double bed, an open-plan full kitchen and living area with a leather sofa and glass coffee-table. It also features a built-in wardrobes, shelves and a desk for dining. This studio has an open-plan living area, city views, a leather sofa, and designer kitchen. 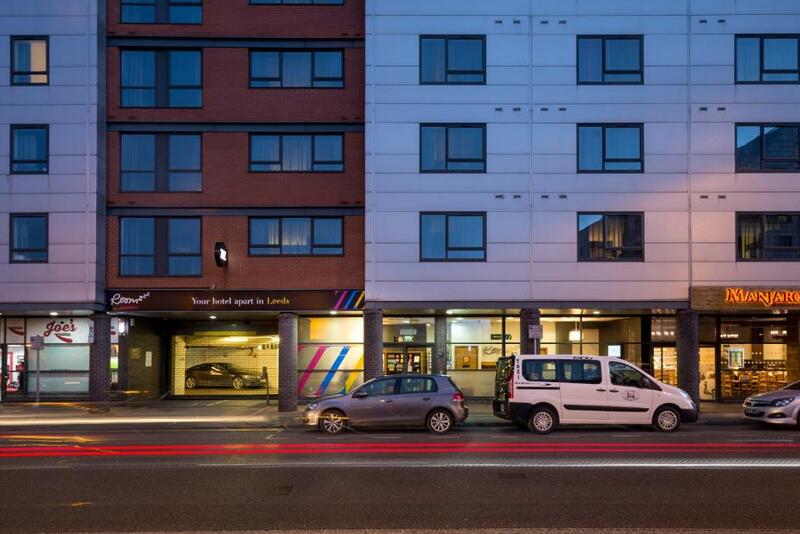 House Rules Roomzzz Leeds City West takes special requests – add in the next step! Roomzzz Leeds City West accepts these cards and reserves the right to temporarily hold an amount prior to arrival. At check-in, guests must have a valid credit card. A security deposit of GBP 20 is required upon arrival for incidentals. This deposit is to be paid on credit or debit card and is fully refundable upon check-out and subject to a damage inspection of the accommodations. The hotel does not accept cash payments. A damage deposit of GBP 20 is required upon arrival – that's about 25.91USD. This deposit is fully refundable at check-out as long as there's been no damage to the property. Rooms are getting a little tired. 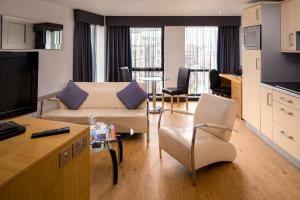 Good size room, friendly staff and ease of transport into the city. Onsite car park is very small, you can park over the road at the itv studio but when we arrived the car park was full of glass from broken windows, staff at the hotel where really helpful though and let me park in the spot for the maintenance guy until a place became available. Had a lovely stay here, rooms are fully equipped, staff are lovely and complimentary breakfast and tea/coffee, will definitely stay again. Good location, one member of staff was great. Long hair, big beard. Very helpful and friendly. Hotel had everything we needed for a nights stay! We came for Easter weekend and staff had provided an Easter egg for us which was a lovely gesture! Complimentary breakfast including pastries, fresh fruit and juice was great and 24/7 hour access to the coffee machine was super too! Our room also had a lovely view of the city! Check out time was early. Too warm in the room, could do with some air con or fans! Ideal location for visiting Leeds. The shower was too small and the towels looked used. The room was comfortable and spacious. 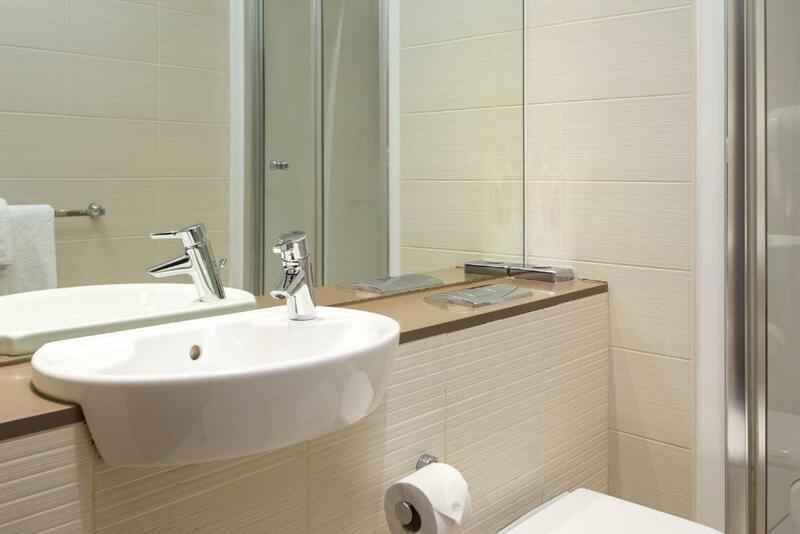 The bathroom had silver fish in it a key indicator that the space in not cleaned adequately. I made the reservation as a group and in spite of this we our group of 8 was given four different rooms across four different floors. I will be complaining to the hotel independently on both of the above issues.